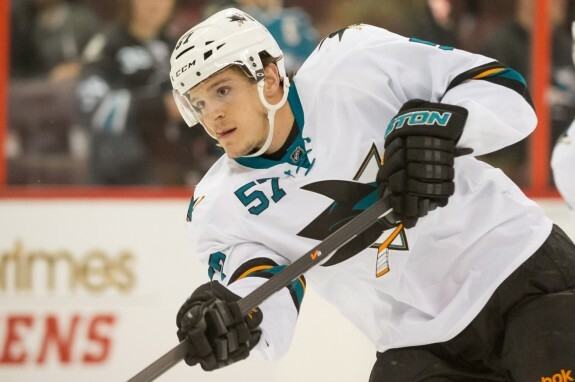 Outside of San Jose, very few are familiar with the name Tommy Wingels. Even a few among the Sharks’ faithful are likely to struggle on a Tommy Wingels’ pop quiz. Having never completed a full 82-game season in the NHL, this is all entirely understandable. But the league should take notice, this third line forward has made the jump to top six. He has created an identity all his own, but his game is modeled after some of his better-known partners. Three of them, in fact. At 25 years old, Wingels is nearing the edge of the “youngster” moniker. But with a first name like Tommy, he’ll always be a kid in my eyes. But youngsters are impressionable. They see the big NHL stage and the superstars around them and model themselves after their favorites. Tommy Wingels took this in a different direction. He molded his game after three very different players. As a forward, Tommy Wingels’ first and most important job is to score goals. While he does not have the talent of sharpshooters like Couture or other elite forwards, Pavelski gets this job done just as well. Mainly through his fearless dives into the crease where the big men live. Wingels takes it a step further. With just a little more size on his body, Tommy can get in there and impose himself on defenders. 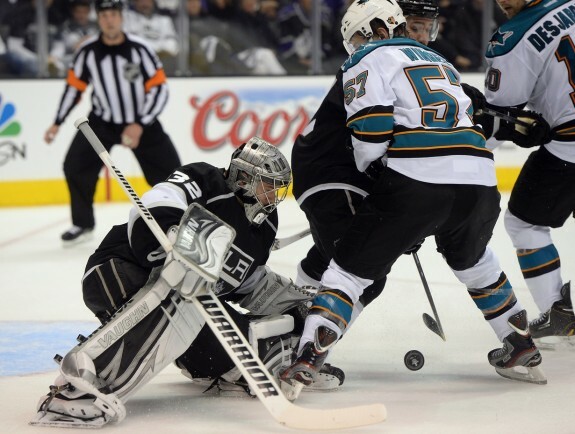 While Pavelski may have quicker hands, Tommy Wingels just bulldozes his way into the back of the net. It’s a rare sight to see Wingels score a goal and stay on his feet throughout the play. That’s just how it works for him. In his 17 games this season, he has already matched his numbers from all 42 of last season with 5 goals and 8 assists. Similar to the way that Pavelski plays, but with more emphasis on the forecheck. Brent Burns has been out for quite some time, but his influence on Tommy Wingels is evident. At 6 feet tall, 200 pounds, Wingels has been a defensive force above the blue line. With 16 blocked shots and 41 hits, he ranks in the top 30 forwards in both categories. He leads all Sharks forwards in hits, effectively filling in the void Burns has left behind. Reckless abandon is usually the word thrown around for Burns’ style. It’s fair to say that Wingels has adopted this mantra and takes his job of “creating chaos” very seriously. Many have labeled him the villain of the NHL. Multiple suspensions, dirty hits, what have you. But, in the end, Raffi Torres tends to play on successful teams. Part of that success can definitely be attributed to the big bruiser himself. Whereas some teams (including the Sharks this season) resort to hiring a full-time fighter, Raffi Torres provides the dirty work while also producing goals. Tommy Wingels has shown on multiple occasions that he is not afraid to get dirty. Often, he places himself right in a goalie’s grill during and after plays. This is usually answered with a face wash and some shoving. What it does, though, is change the mind set of opponents. Tick them off enough, they may take a stupid penalty or lose focus just long enough to force a turnover. Fighting may be a part of the game, but if it’s the only part of your game, you shouldn’t be playing in the NHL. Can He Sustain His Success? The question posed, then, is how far can Wingels take his newfound success? Unlike other streaky players (ahem, Patrick Marleau), Tommy’s points are produced almost entirely through rebounds and scraps in front of the net. He doesn’t need to shoot through screens or deke a defender out of his skates. He just has to be in the right place at the right time. With his bursts of speed, that should not be a problem. Moving up to the Thornton line has him playing against the best defenders in the NHL, but with his captain right by his side, I would bet against him losing his way. While it may be too late for him to make a meteoric rise to superstar status, Wingels will certainly make a big impact. Once the Sharks get back to full strength, he may be pushed back to the third line, but his valuable experience up top will make that already-dangerous third line with Joe Pavelski on par with many teams’ top six.